Yet another rotation around the sun! 1.) Invest in good quality, well-fitting shoes. Because let’s face it, you’ve stopped growing. 2.) Eyebrows are EXTREMELY important! You spend so much time watching makeup tutorials on YouTube, why not make sure you have nice brows for your grad photos? 3.) Don’t stress out if you feel like you don’t fully belong in any one group. It’s okay to be a floater. 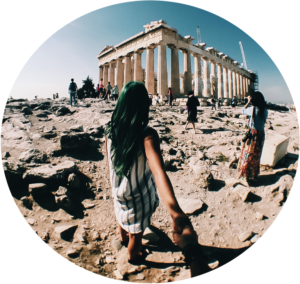 Being able to get along with all sorts of people means that you’re flexible, an attribute that will come in handy when you find your passion for travelling at 17. 4.) Don’t listen to the “cool kids” who make fun of you for taking your studies seriously! They’re the same people who will peak in high school. 5.) … Speaking of high school, I’m going to be honest. You won’t even remember 99% of the kids you went to high school with once you’re in university. Have fun, create memories, but don’t be too invested into friendships since you and your peers will naturally grow apart. 6.) Love your body! Self loathing doesn’t do anything for you. Exercise, but make sure you’re engaged in activities you enjoy. You don’t have to bore yourself with counting reps in the weight room if you’d much rather take a dance class. Eat well, but treat yourself occasionally. A chocolate bar once in a while isn’t going to kill you. It’s all about balance. 7.) Read up on structural racism, sexism, Islamophobia, and other social justice issues that affect you and your community. You know, topics your teachers only briefly touch on in high school. The sooner you are aware of systems of oppression, the sooner you can work to dismantle them. 9.) … Speaking of boys, why are you even dating anybody right now? You aren’t in love. Besides, the boys you will meet in post-secondary have so much more going for themselves, and even more so once they’ve graduated. 11.) Just because your parents want you to be an engineer, doctor, lawyer, whatever, doesn’t mean you have to be any of those, even if you’re 100% capable of being successful in those fields. You’re a creative soul, and this is your life to live. The last thing you want is to feel trapped in an uninspiring career path. 12.) You will still be obsessed with everything you got into at 13. You will still love building websites. You will still love experimenting with makeup and clothes. You will still love your favourite video games. Don’t be in such a rush to grow up – enjoy your childhood for a little bit longer while you don’t have a ton of responsibilities. 13.) You are an idea-generating machine! Don’t allow your lack of resources or the work ahead of you prevent you from starting those big projects. The time will pass anyway – you’re going to wish you had started years ago. 14.) Don’t do drugs. … But if you do, do them with people you trust. In a private home. And not the hard stuff. 15.) Being sloppy drunk is not cute and never will be! 16.) Take pictures. Lots of them. Then put your phone down and live in the moment, because you will never be as young as you are now. What do you wish your future self told you 5 years ago? Thanks for reading my thoughts and for making me feel special on my 21st birthday! Make sure to share this post with someone in your life you think would benefit from my advice!